When I sat down to watch “King Arthur” over this past weekend, I was a bit apprehensive. This big-budget, big-name feature film didn’t last very long in theaters (never a good sign) and it received overall negative reviews (typically, not always, not a good sign). However, in the name of duty and honor and the necessity for “Medievalist at the Movie” reviews, I set myself to the task. It was actually pretty entertaining! I’ll preface this review with a disclaimer that I am not an Arthurian scholar, however I have read the introductory “basic” translations and popular modern fiction. I also have several friends who participate in meticulously researched reenactment and are slightly obsessed over costume accuracy. The plot deviates widely from the stock Arthurian legends and almost completely excludes the traditional female characters. Vortigern is the main baddie, played by a slimy Jude Law who gives off a somewhat tortured attitude. Here Vortigern is Arthur’s uncle and a secret partner of evil mage Mordred, who stages a coup against King Uther Pendragon played by always-yummy Eric Bana. The film opens with Mordred’s forces attacking a highly defended Camelot and a sense of despair growing among Uther’s men. Uther leads the charge by leaping off the main bridge with Excalibur into a platform strapped to an impossibly large elephant possessed by evil aggression. Excalibur lights up and its power extends to Uther’s eyes as they change to a brilliant blue. Later, after the victory and Mordred’s death, Vortigern stages an attack inside the castle. Uther realizes that his family is in danger and rushes his wife Igraine and the young Arthur to a boat. Vortigern catches up to them with power enhanced after sacrificing his wife to an unknown force. Ironically Katie McGrath (the actress playing Vortigern’s ill-fated wife) has some strange career recurrences here: she also starred in the cult favorite Merlin AND her character was killed early in Jurassic World. We see most of the fight between Uther and Vortigern, including the death of Igraine and the departure of Arthur in the boat. He floats away to Londinium where a couple of ladies (let’s call them ladies of the night?) pick him up and take him into a brothel. A montage of his growth overlaps opening credits (yes, ALL that is before the opening credits) and we flashforward to adult Arthur played by Sons of Anarchy alum Charlie Hunnam, who now controls the brothel and take a cut of most of the neighborhood’s business. He’s secreted away a sizeable coffer in a hidden closet and has a loyal pack of friends/gang members. There’s a friendly kung fu training center next door and it appears that Arthur knows some marital arts. There’s a scuffle with some Vikings who refuse to pay Arthur his share, and this brings the local royal guard Captain to his door. From this moment, the tension between Arthur and the crown only increases throughout the film. Arthur eventually pulls Excalibur from a stone where it was mysteriously trapped since Vortigern’s coup 20+ years earlier. A scrappy band of rebels led by a young female mage and Bedivere (surprisingly well cast with Djimon Hounsou in the role) spring Arthur and Excalibur from Vortigern’s grasp and his rise to glory and the crown begins. The script overall is weak. The plot has a few holes and I think it would be stronger if there was more of the source material referenced. It fails to include any of the numerous female characters in the legends aside form Igraine and is almost completely male-centric. The one exception is “The Mage” played by Astrid Bergès-Frisbey. As the only female lead among more than 10 recognizable male characters, she doesn’t even get a name! It’s possible that she’s meant to represent Merlin’s student/lover/wife Nimue, however there’s no reference to this. We learn that Merlin forged Excalibur and that’s his only role in the whole thing. The Lady of the Lake makes a very brief appearance and barely registers as a character. Yes, Maggie has a little action but not much. To director Guy Ritchie: you like groups of men exchanging rapid-fire dialogue. We get it. Throw a lady or two into the mix, wouldya? Thanks. I might be able to give a thumps up for giving the lady characters most of the magic powers compared to the men however I still wish their roles were expanded into something more significant. Or maybe give them, like, a NAME or something? Another note for Ritchie: That rapid-fire style works when characters aren’t really discussing anything of importance; it’s not as effective when your actors are actually trying to get plot points into the minds of the audience. This contributed somewhat to the lost plot points and missed details. For example, the Mages as a group (or people, or race, or something like that) are killed when Vortigern takes power (I think) so where did Bergès-Frisbey’s character come from? Arthur and other characters question her origins multiple times yet the questions fall flat and are never addressed. Either a key scene was cut in editing or someone missed a major hole in the plot. My last negative comment is from the historian’s point of view. I can’t figure out what time period we’re working with here. Most of the Arthurian stories reference the departure of the Romans and/or the Saxon invasion of Britain, yet there’s that band of Vikings hanging around the fringe of the plot. The fourth century and the ninth century are not the same thing in case anyone was wondering. With that being said, there’s a satisfying diversity throughout the film. The Londinium skylines and sets are a fantastic mix of crumbling villas, quays, aqueducts, and roads. Just as society is descending into competing political interests and squabbling city gangs, the remnants of the Pax Romana crumble to the ground. The cast helps with the diversity element too, considering this is a mainstream Hollywood action/adventure flick. Medieval Britain, no matter what century we’re looking at, was a diverse place. Isotope and DNA analysis on Roman burials in York and London identify people born in Africa, the Middle East, and Asia so there absolutely should be more than just Caucasian actors included here. As mentioned above, Djimon Hounsou plays Bedivere, there is an Asian kung fu master running a gang in London, and one of Arthur’s brothel gang back-ups (“Wet Stick”) is played by Kingsley Ben-Adir. Most of the cast is Caucasian however it’s nice to see at least a small effort. I hope the production gets lauded for this even if it doesn’t garner much other praise. There is lots of swordfighting and while there’s a modern fight choreography style it’s still entertaining to think about how medieval knights might’ve moved and worked with their weapons. Speaking of swords, there’s quite an interesting take on THE stone. Uther, battling Vortigern and realizing he’s going to lose, pushes Arthur’s boat away from the dock as he hurls Excaliber into the air. Uther takes a knee, lowers his head, and locks eyes with Arthur. Excalibur comes hurtling back down straight as an arrow into Uther’s spine. This triggers some kind of magic spell which fossilized Uther into stone, trapping Excalibur and plunging into the water. To me this was a unique way to address the mystery of how the sword becomes trapped in the stone. There is a nod to the source material with a cursory exchange from the Lady of the Lake however this is a tidy and fitting solution to the sword in the stone element of the story. It’s imaginative, and it fits folklore patterns by having a parent hand off a magical item to the child. 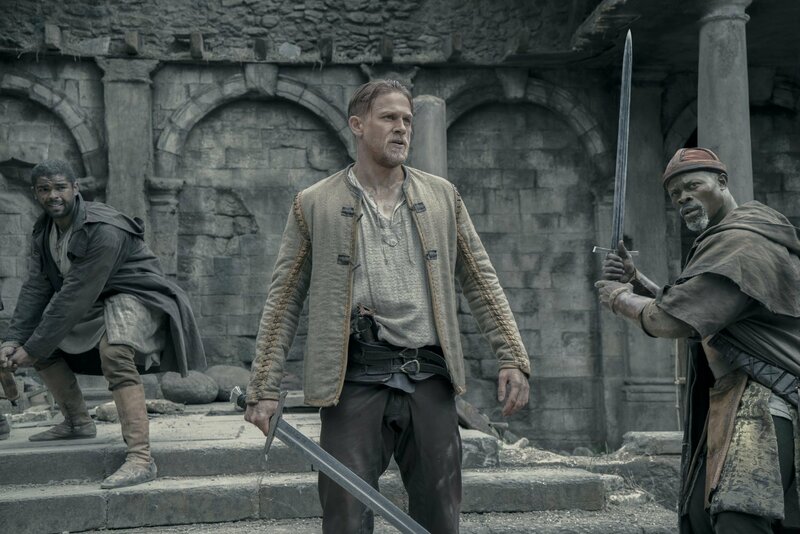 King Arthur isn’t likely to win any awards (maybe something for costuming, make-up, or special effects) but it’s a fun time and a decent attempt to adapt the Arthurian tales for a modern audience. I think Guy Ritchie, the set decorator, and the costume designers were perhaps overly influenced by Lord of the Rings and Game of Thrones, but the film manages to stand on its own stylistically. There’s a strong Cinderella-esque appeal and I wish the female characters had more agency yet I have to acknowledge the Londinium sets and attempt at diverse casting. If you passed on a theater viewing, check out a DVD or rent a streaming copy. I think you’ll find that small cost worth it. Danielle Trynoski is the West Coast correspondent for Medievalists.net and is the co-editor of The Medieval Magazine.